European retail markets are mostly in good shape at the start of the year. However, retail investors in Europe will need to adjust to a growing gap between robust retail markets and those that are subject to high risk in the long term. 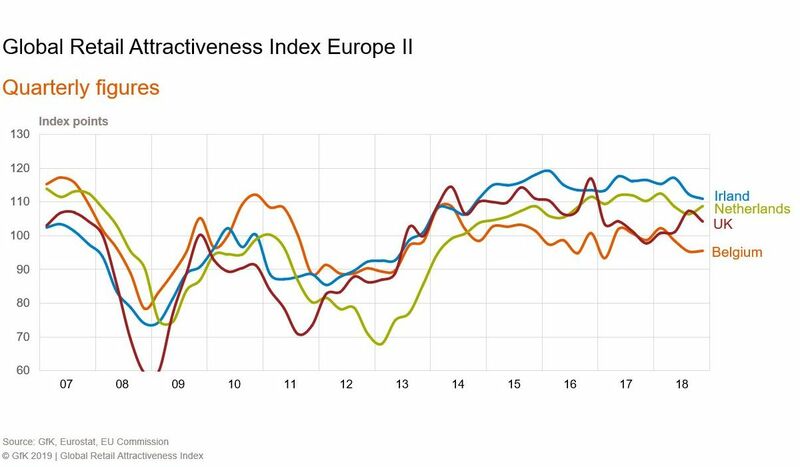 As Union Investment’s Global Retail Attractiveness Index (GRAI) shows, there are 25 points between the current top performer, Portugal, and the weakest market in Europe, Belgium. This difference is the largest that has been recorded for the index over the past 12 months. “The ongoing positive economic climate in Europe, which is delivering rising revenues for online businesses as well as brick-and-mortar retailers in almost every country, is softening this trend at present. However, any sustained weakening of consumer sentiment is likely to cause retail markets to drift further apart,” said Henrike Waldburg, Head of Investment Management Retail at Union Investment and Member of the ACROSS Advisory Board. The German retail market remains one of the top performers globally. Its stable top-tier position is due in particular to consistently strong increases in retail sales. Germany is also the only country in the GRAI’s EU-12 index to see a slight rise in consumer confidence compared to Q4 2017 (+2 points). In all the other European regions surveyed, consumer confidence in the domestic economy is deteriorating to a greater or lesser extent. “The buoyant employment market and optimistic income expectations mean that German retail markets are particularly well supported. Local players and increasingly also foreign investors are attracted by the prospect of very predictable cash flows,” commented Henrike Waldburg. With 110 points, the EU-12 index remains above average. Alongside Germany (115 points), the supportive top tier again includes the Eastern European countries Poland (118 points) and the Czech Republic (117 points). Like the Czech Republic, Portugal scored more highly than in the prior year, gaining two points to reach 121. This puts it in pole position in the EU-12 index for the first time. “Portugal has successfully worked through its serious financial and economic crisis and regained its popularity among retail investors,” said Henrike Waldburg. Another Southern European country has made it into the top five for the first time: Spain, with 114 points. This is due to particularly strong sales in the Spanish retail sector, which underlines the optimism being felt on the provider side. Ireland, previously a major concern, scored less well (111 points), but despite a marked decline (minus 6 points) still performed better in the fourth quarter than mid-ranked countries such as Austria, Italy and the Netherlands. 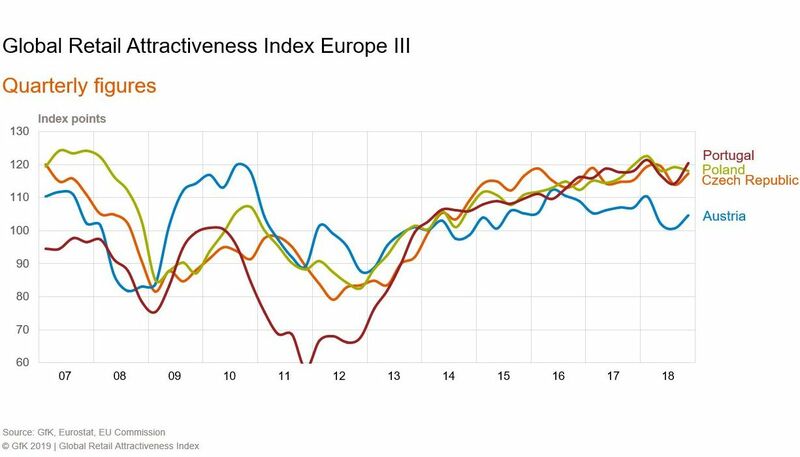 In line with the current three-way split in the European retail market, consumer sentiment, business sentiment and the consumer price indices vary significantly from country to country. But across Europe, rising sales in brick-and-mortar retail and by online businesses are largely a common theme. The indicator for retail sales performance gained a total of 15 points compared with the previous quarter. Accordingly, the EU-12 index lost very little ground overall compared to the last survey a year ago (minus 2 points). Relative to the North America index, which was unchanged at 113 points, the Europe index is down slightly. The EU-12 index was able to gain some ground compared to the Asia-Pacific index, however. A sharp fall in consumer sentiment in South Korea meant that the Asia-Pacific index declined by 4 points to 106 points, putting it third in the global ranking behind North America and Europe. In contrast to the robust performance of the top five European markets, the survey found that structural deficiencies lower down the rankings have got worse. “While retail in Europe is mostly benefiting from the global recovery, the markets in Belgium and France show early signs of a crisis. 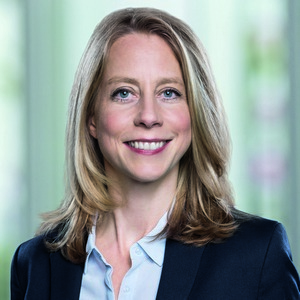 The ongoing negative trend presents specific challenges here for retail investors’ risk management,” said Henrike Waldburg. Belgium is now the worst performing retail market out of the 12 covered in the survey by an even wider margin. Of particular note is the fact that with 96 points (minus 3 points), it is the only European country not to have reached the 100-point mark. Internationally, out of the 17 markets analysed only South Korea is similarly weak. 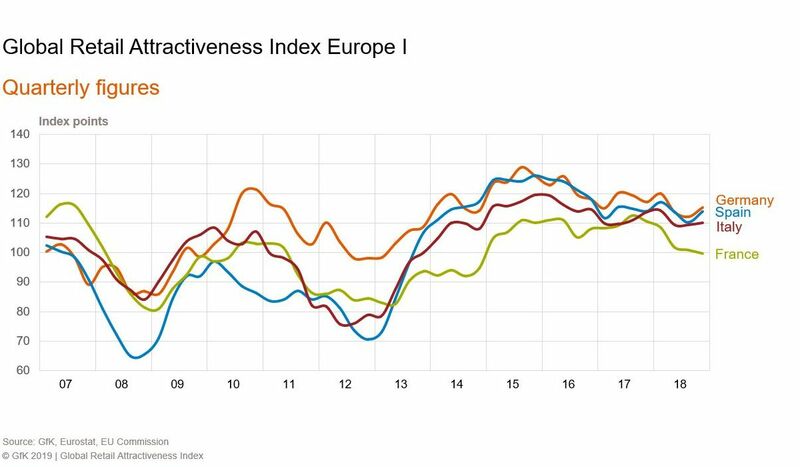 At 110 points, the Retail Index in Europe remained above average in the last quarter of 2018. In addition to sentiment indicators, the development of retail sales at the end of 2018 also proved to be a key driver.Both consumer and retail sentiment, at 114 points each, and retail sales, at 115 points, contributed to this positive level. Inflation, on the other hand, at 95 points, only made a below-average contribution to the overall index. The index lost some ground during the course of last year. Compared to the fourth quarter of 2018, the drop amounted to 2 points. This was primarily due to the more negative development of prices, at -9 points, as well as consumer and retail sentiment, which fell by 5 and 7 points respectively. Conversely, retail sales made a significant positive contribution to the development of the overall index with an increase of 15 points. At country level, Portugal currently leads (121 points), followed by Poland (118 points) and the Czech Republic (117 points). In the fourth quarter of 2018, Belgium, the only European country below the 100-point mark (96 points), came in at the tail end of the group.A significantly below-average sentiment among retailers (85 points) and inflation (86 points) are responsible for this weak development. Three countries, the UK (+6 points), Portugal (+2 points), and the Czech Republic (+2 points), showed positive developments in this quarter. The biggest losses in this quarter occurred in France, at -11 points, followed by Ireland, at -6 points. Union Investment’s Global Retail Attractiveness Index (GRAI) measures the attractiveness of retail markets across a total of 17 countries in Europe, North America and the Asia-Pacific region. An index value of 100 points represents average performance. 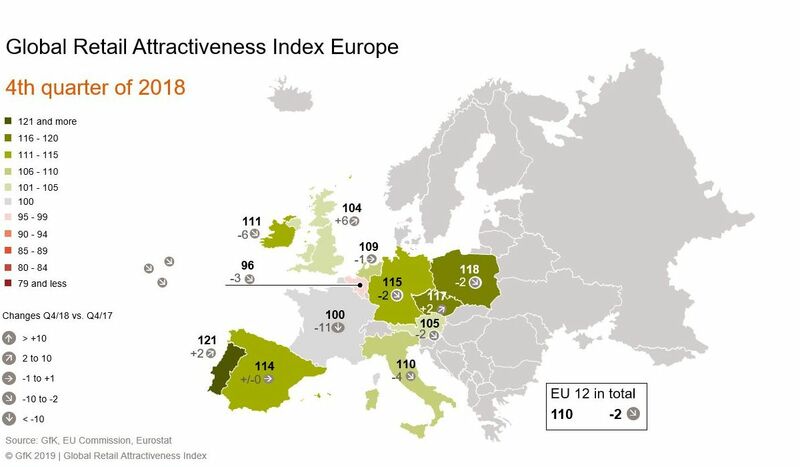 The EU-12 index combines the indexes for the following EU countries, weighted according to their respective population size: Germany, France, Italy, Spain, the United Kingdom, Austria, the Netherlands, Belgium, Ireland, Portugal, Poland and the Czech Republic. The North America index comprises the US and Canada, while the Asia-Pacific index covers Japan, South Korea and Australia. Compiled every six months by market research company GfK, the Global Retail Attractiveness Index consists of two sentiment indicators and two data-based indicators. All four factors are weighted equally in the index, at 25 per cent each. The index reflects consumer confidence as well as business retail confidence. As quantitative input factors, the GRAI incorporates changes in the consumer price index (inflation) and retail sales performance. After standardisation and transformation, each input factor has an average value of 100 points and a possible value range of 0 to 200 points. The index is based on the latest data from GfK, the European Commission, the OECD, Trading Economics, Eurostat and the respective national statistical offices. The changes indicated refer to the corresponding prior-year period (Q4 2017). Deloitte’s latest “Global Powers of Retailing 2019” study has listed the 250 top-selling retail companies for the 22nd time. According to a recent study by PricewaterhouseCoopers (PwC), more and more Germans are returning to shops – where they often find a range of services with room for improvement. The ultimately 382-meters high “Abu Dhabi Plaza” in Astana is about to become the highest building in Central Asia. It also accommodates a shopping center, among many other things. A Physical Presence is Key to Consumer Engagement and Success. There will be two new retail properties in the Grand Duchy, as Cloche d’Or and Royal-Hamilius will be opening there this year.